We were visiting my father, who lives in Hong Kong, and went shopping for food in a shopping mall in Hang Hau. The mall was a typical Hong Kong mall: all gleaming marble and glass, so clean you could eat your dinner right off the floor. For some reason we went down into the basement, into a corner, and through some big steel doors. Suddenly we were in a traditional Chinese village market, full of simple market stalls, tied-up chickens writhing in piles, fish swimming in tanks, crabs flexing their legs in chicken wire baskets, tropical fruits, and a huge crowd of people jostling around. We went around staring at things at random until my stepmom announced we were ready to go home. Back in the flat I noticed the garbage had started to smell, but figured in a damp tropical climate that was probably a regular occurrence. Anyway, after a while we were ready to eat, and my father announced that we were going to have a "fruit feast," as he called it. They'd bought a number of different tropical fruit so we could try some different ones we probably hadn't eaten before. Out came longan, which is kind of bland, and not really that interesting. Then there was dragonfruit, which looks really cool, but has hardly any flavour. Mangosteen looks rather like garlic when you peel it, and has a kind of sweet spicy lemon sorbet flavour. I really liked that one. Then there was a big, green fruit my father called "Martian's brains", which I think was really a kind of custard apple. It was intensely sweet, and tasted like candy. Then my father got all excited, said "this is my favourite," and fetched a massive fruit armoured with big, hard, sharp spikes. It was when he opened it that I realized there was nothing wrong with the garbage. It was the fruit that was smelling. "We call it stinky fruit," my father said, with a huge grin. And stink it did. Waves of aroma were washing over us, a smell entirely unlike anything I'd ever experienced before. In time I've managed to analyze a bit of it. One very distinct aroma is that of rotten onions. Another is something like gasoline or propane. Then there's a whole complex of aromas reminiscent of strawberries, vanilla and honey. There's also that garbage smell, an amazing reek of rottenness and corruption, which doesn't so much remind me of my kitchen garbage back in Norway, but more of a vast pile of garbage and human corpses rotting in tropical heat and humidity. Finally, there's a strong element of something that's totally unique, and can only be described as durian aroma. If you think I'm exaggerating, check the quotes on Wikipedia. Also, consider this news report, of the Trondheim fire department checking out a reported gas leak, before finally tracing it to ... a shop selling durian. That smell really is something. My father took out a knife, made an incision in the base of the fruit, and peeled the skin (or armour) away, revealing five chambers inside. In each of the chambers was something resembling most of all a slimy fatty alien foetus, half decomposed, and sickly yellow-white in colour. I stared at it in fascinated horror and for a moment entertained doubts about whether I was really going to put this stuff in my mouth. I'm a real enthusiast for new taste experiences, and the more outlandish the better, so I gathered my courage and dived in. In the mouth it feels most of all like a soft, fatty banana, though the meat goes stringy towards where it's attached to the seeds. The flavour is strikingly different from the aroma. It's dominated by the vanilla and honey aspects, and the aftertaste is slightly bitter and has that unique durian thing that's also in the aroma. Did I enjoy it? Well... I certainly did enjoy the experience of trying something so utterly insane. The flavour I didn't really enjoy. It was just too outlandish and different from anything I'd ever had before, and I was having real difficulties getting over how intensely repulsive the thing looked. Focusing on the flavour has been a recurring problem, because the flesh looks so intimidatingly repulsive, while the stench just keeps hammering you. At this point you may well be wondering why anyone would eat something like this, but durian is actually the national fruit of Thailand. The city of Kampot, in Cambodia, has even built a temple to it. It is very highly regarded, and quite expensive. Since there are many different species, and the aroma changes with how ripe the fruit is, many people will go to great lengths to seek out durian with particular flavours. Here's a great picture of a durian connoiseur in the middle of that process. So in fact, in East Asia durian is a very big deal. As one writer put it a century ago: "The natives give it honourable titles, exalt it, and make verses on it." In fact, in south-east Asia, durian is generally known as the King of Fruits. Alfred Wallace thought the experience of eating durian worth a journey to East Asia in itself. That becomes even more remarkable when you realize he wrote that in 1856, when the journey took months and involved real danger. Unsurprisingly, given how popular the fruit is, there's a whole range of products made from durian, like durian pancakes, ice cream, sauces, pastries, milkshake, cappucino etc etc. There's even a dish made from fermented durian. Imagining what that must smell like is enough to make me feel dizzy. Though, equally unsurprisingly, there are quite a few people who hate the smell of it. 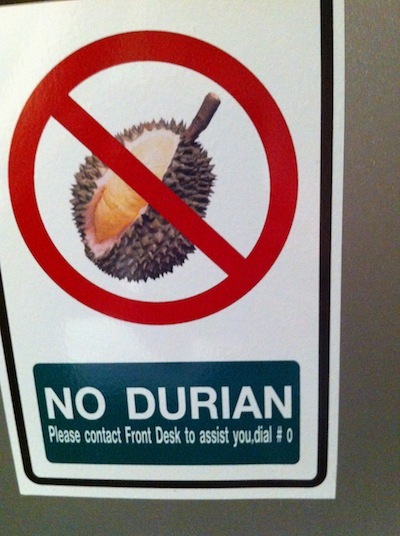 Enough so, in fact, that signs saying "no durian" are quite common in buses, hotels and so on. And you can see why, because sitting on a hot bus for fourteen hours through rural Indonesia, bathed in the intense stink of durian, must be enough to drive anyone insane. When, a few months after coming home, I discovered a Vietnamese shop in Oslo selling durian I couldn't help myself, and bought one. I served it at a family gathering, which was an interesting experience. Four of the adults present had eaten it before, five had not. Of the remaining five, none of whom are picky eaters, only three dared taste it. None liked it. One person was going around in circles, looking dazed, now and then pointing out new aspects of the aroma that he'd noticed. My oldest sister was actually downright angry, and told me I should go outside and eat it in the shed. Why did I buy it? Well, I'd tried it again before leaving Hong Kong, and still didn't much enjoy it. But it was such a crazy thing I just had to give it another go. And now, having tried it a couple more times in Norway, I really like it, and sometimes feel a real craving for durian. Unfortunately, having a craving for durian is a bit of a problem. For one thing, durian is quite expensive. It costs around 85 kroner (10 EUR) per kilo, and a single fruit generally weighs around three kilos. That's a lot of fruit, so I wind up eating durian every day for a week, while the house stinks so bad I worry what the neighbours will say, and my wife looks at me as though I'm eating little baby aliens. So today I was really happy, because my wife came back from Thailand with a gift for me: a box of dried durian. Even in dried form the smell is a crazy riot of aromas, and the flavour is that same familiar, if somewhat subdued. But now I can eat a piece here and a piece there without having to gorge every evening, and without bothering anyone too much. I should add that the only variety of durian I've tried is monthong, which has a milder flavour and, as Wikipedia puts it, a "relatively moderate smell". If that's relatively moderate I'm curious what "strong" would be like. Anyway, monthong is the only kind of durian that can be exported without going bad, so if you want to try the other types you have to go to Thailand or Indonesia. Which, obviously, is something I very much want to do. Hi, the fruit you have labeled as "lychee" is really longan. Longan is much milder in flavor and lychee has a red, slightly spiky peel. @Knut: Yeah, I guess there is an over-emphasis on everything but the flavour. Thanks for introducing me to it! @Ann: Thank you for pointing that out. Corrected now. The durian fruit sounds so awful it has to be tried :) Thanks for another well written piece on a unique taste experience! Travelling to South-East Asia ages ago (end of the 1980s) I remember the signs "No durian!" on buses in Malaysia and Indonesia. Unfortunately (?) I never tasted the fruit, but I got to smell it. And boy, did it smell! as you have described very well in this nice post. @bernt: That's what I was hoping people would think after reading this. @Svein: Why wouldn't you want to taste it? The smell is bad, but the flavour is really nice. It's a bit like the more challenging cheeses. Ditto Knut:) Durian flavor is beyond description, as it seems to contain flavors of all fruits that exist, and more. From my experience most of the people dislike the assault of overwhelming flavors at first. It takes another try, or third to see a convert, if one's to be. I tried durians, sometimes on a daily basis for weeks, in Thailand, Cambodia, Malaysia and Indonesia - there are surprising number of varieties, very different in taste (some are very rare and super expensive). Add to that a strong influence of location, weather, ripeness, picking and storing to the flavor. Even in such a small island as Bali, local durian tasted differently every day.